The Antique Grid Show Autumn Hunt begins today. 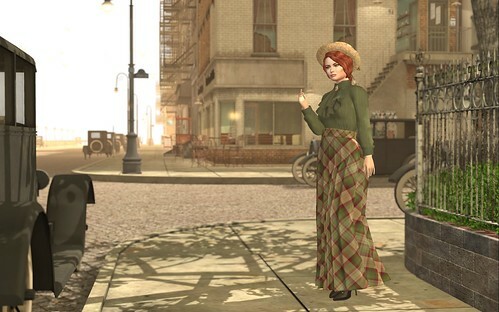 My hunt gift is a late nineteenth century style outfit – Miss Pearl Parker – with hat, blouse and skirt in Autumn greens. Check out this blogpost on the nostalgia a la mode blog. The lovely picture with the gorgeous light was taken at the 1920’s New York Project. I’ve never been one to make it difficult for hunters, but if you don’t move far enough into the room you might miss the leaf. It’s a flat plane that is hard to see from a side view. You’ll see the skeleton, just move around in front of him. This entry was posted in Edwardian, Events & Happenings, Victorian and tagged Antique Grid Show, Edwardian, hunt, turn of the century, Victorian by abathyr. Bookmark the permalink.